Dillard Spray Foam Insulation is used in buildings, and refers to the application of thermal insulated materials, which are applied using various spraying methods, into a roof space or wall cavity to prevent heat loss. The application of this process is normally completed within two days. 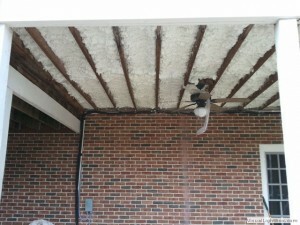 Dillard spray foam insulation does not particularly address ventilation or sound proofing issues. It simply refers to the insulating materials being used to slow heat loss. The effectiveness of it is usually evaluated by its R-value, but this does not take into account construction or local environment factors. Thermal spray foam insulation is easy to apply. Foam insulation is sprayed onto or into the underside of the roof within the attic/loft space, and dries to rigid foam. We take great pride in the work that we provide to the Dillard area, and are extremely proud of the products that we offer. We even use this insulation in our own homes, and are passionate about the services that we provide. If you want to make the most out of your energy savings, make certain to get the service of the professional team who know exactly what it takes to make that happen. There’s no reason that you should undertake the risk of removing your insulation yourself, when you can have the service provided by a professional. There are man1y different health risks that insulation can present, and you should never breathe in the substances that can become airborne during the removal process. Instead of putting yourself at risk, have your insulation properly removed and disposed of, by the team at Southeastern insulation. If you’re looking for a professional Dillard Spray Foam Contractor, then give us a call today at 678-561-FOAM or complete our request estimate form.